Tension Set 14kt Gold Sphere. The links that connect the round ones are polished for a two tone effect. The Snap Clasp is also round identical to the links for a smooth effetct. Ideal for everyday or special occasion. The Clasp has the same link design, it snaps very comfortably. Please indicate Length in the "message to buyer" during checkout. By statistical, practical and mechanical point of view this kind of setting will never loose the Stone. Only by the use of a special tool, a Stone can be de-mounted from this settings. High quality Stainless Steel 316 is revealing a new vista for jewelry designs, as you can now be adorned with indestructible fashion statements: looks just like Platinum but 1,000 times stronger, and much less expensive. It is clear, hard, radiant, very durable, it needs little maintenance, waterproof and will never tarnish, is not subjected to oxidation (if you swim with Our jewelry they will not rust) and wear and tear. In terms of safety: Stainless Steel 316 it is virtually allergy-safe (hypoallergenic). This is due to the fact that Stainless Steel 316 has only 10 to 14% of nickel in it and it is so tightly bound in the material that the leakage of nickel is below the threshold value set up by most of the countries. In terms of durability, Stainless Steel is superior to most of the precious metals and can survive the toughest abuse. Stainless Steel although readily available, increases in value through Our designer's workmanship and handling of it, especially when combined with gold, silver, pearls, rubber (PVC), precious and semiprecious stones. Imperfections and scratches, from abuse, can be easily buffed-out without damaging the integrity of the piece, unlike other traditional alloys used in the manufacture of jewelry, which if bent, or "fixed" a number of times becomes thin and weak, resulting in the untimely loss of the piece altogether. Our designs can't be duplicated by using casting techniques like traditional over-the-counter jewelry, manufactured of softer alloys: platinum, gold or silver, (that is stamped-out by machine or poured into molds, lost wax techniques), because each and every of our piece must to be worked totally by hand. Every piece of VT jewelry is hand-cut from its solid Stainless steel piece, cutting away the excess, leaving no seams, or dents spots, until the final result is reached and consequentially becomes one-of-a-kind. We do give to Our jewelry two different finish depends to the design and also the kind of final effect we are trying to achieve. Mirror shine and soft brushed (satin finish). 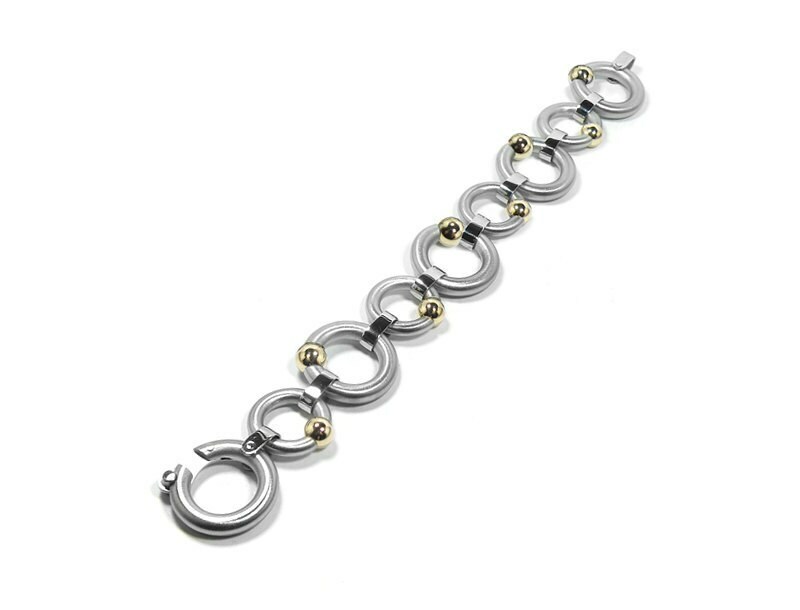 The mirror shine commonly called high polished; it's very much like the platinum polished look, and the brushed finish we particularly prefer, because it gives a dramatic modernist contrast with the Yellow gold and the Black pearl. When you purchase one of our design, in order to fulfill your needs you have the opportunity to choose the metal finish. You can Pay using Etsy Direct Checkout or PayPal. We will send Order & Shipping Emails Confirmations to The ETSY Mail Box or the Email Address you provided to PayPal, therefore Please make sure that your Email address is updated or we will unable to communicate. If you use a spam blocker program or other email filter your order confirmation and shipping notification may not get through to you. If for whatever reason you don't receive our Confirmation Emails, please contact us ASAP, and we will resend the confirmations. Taormina Jewelry Inc. is based in Philadelphia, Pennsylvania. According to state and federal tax rules, we are required to charge 7% sales tax on any item shipped to a Pennsylvania address. > Note: business days does not include weekends or national public holidays. NOTE: UPS cannot be applied towards orders being shipped to a P.O. Box. Please contact us (via THIS ETSY SHOP CONVO) with your specific time frame and we will do our best to speed up production process and accommodate your request. In 4 years of selling at Etsy.com we never had a situation where the buyer never received the package because was lost in the mail. However If you would like to have your purchase shipped with USPS insurance, please write in the "message to seller" during check out that you need insurance and we will add it at no extra cost. If your package (after a reasonable delay) doesn't arrive or get lost in the mail and you asked us to add insurance, you can file insurance claim to your Postal Office and USPS will refund your money. If you need a paper copy of your transaction receipt, go to Purchases > Receipt > Print the Receipt. If you use PayPal during checkout and your purchase doesn't arrive, you are covered by the PayPal Buyer Protection Program and they can help you get all your money back. If an incorrect shipping address is provided by the buyer, the order will be returned to Taormina Jewelry, Inc. and the cost of re-shipping the order will be covered by the buyer. In order to avoid delay, along with your address, please provide your Phone Contact, so UPS can call you in case of being unable to delivery. Please consider 7 to 10 business days for production and 3 to 4 business days for delivery. Please note that business days does not include weekends or national public holidays. If you have any questions regarding International Orders, please don't hesitate to contact me. Taormina Jewelry Inc. only assumes responsibility for a shipment while the item is in its possession. Upon delivery of the item to the shipping carrier, the laws and regulations of the shipper become the regulating laws of the shipment. The risk of loss of the item passes to the buyer upon delivery to the carrier. Taormina Jewelry Inc. will not be held responsible for lost shipments that are the fault of anyone but Taormina Jewelry Inc. and will not be held responsible. Taormina Jewelry Inc. is not responsible for delays in transit or failure to delivery due to Incorrect address, fire, flood, strike or other labor difficulty, act of God, act of any governmental authority or of the customer, riot, embargo, fuel or energy shortage, wrecks or delay in transportation, inability to obtain necessary labor, materials, services or manufacturing facilities from usual sources, failure of suppliers, inability to obtain necessary proof of delivery and signature from recipient, or any other causes of like or unlike nature beyond Taormina Jewelry Inc. reasonable control. If you have requested via email to have your order shipped to a different address, in the case of exchanges or future orders, the Email request of change of address has to be done again, because we will always use the original address that Etsy Checkout or PayPal have on file, please review it and make sure is up to date. If an Incorrect shipping address is provided by the Buyer, the order will be returned to Taormina Jewelry Inc and the cost of re-shipping the order will be covered by the Buyer. Every piece is delivered in a Elegant Jewelry box, ready to give as a gift! All the Jewelry you order at Taormina Jewelry is Special made for you (ring sizes, gemstone, length etc..). If you are not delighted with your purchase, please return the unused item in its original condition within 10 DAYS. Since all our Jewelry are "made to Order", we cannot refund money, but you will receive an online STORE CREDIT ONLY. This credit will Not expire, and is only usable anytime at Taormina Jewelry at Etsy.com Note: Taormina Jewelry is not responsible for the shipping charges that the buyer will pay for returning (also exchanging) the Item to us. For regular orders, Buyers have ONLY 3 days window (72 hours) opportunity to cancel an Order. If a Buyer have requested and paid for Express Production and Shipment, the Buyers have ONLY 1 day window (24 hours) opportunity to cancel an Order. All orders that are cancelled more than 1 day (24 hours) after order receipt date are subject to a 50% cancellation fee of the original price. If the item has already been shipped, it must to be returned the next business days, via USPS Priority mail with delivery confirmation..
You can exchange your Item towards one of equal or greater value from Our Catalog on Etsy. Please return the unused item in its original condition within 10 DAYS. If you select an item of lower value, the balance will become Store Credit and it can be used any time at Taormina Designs on ETSY. NOTE: In the case of Exchange or Repair Service, If your shipping address you used originally is now different, it's your responsibility to inform us via email. ● IMPORTANT MESSAGES ABOUT WRONG SIZE of Necklaces, Bracelets and Rings and Missing Info. If you have requested the wrong length for Necklace or Bracelet, please contact us, we will Email you the shipping procedures, and gladly re-size* it for you (*Resize Fees May Apply). In most of our listing length need to be comunicate during check out in the “message to seller”. If we receive an order for Necklace or Bracelet without length info, we will contact you 3 times via email (etsy mail and personal mail) if we don’t receive an answer, we will proceed using standard size of 18” for necklace and 8” for bracelets. Occasionally, we are able to offer either a special price on a particular item or category, or we have a site-wide sale on everything. Special orders are not eligible for sale prices, even if they arrive during a sale period. Sale prices are ONLY good during the sale dates. Taormina Jewelry do not refund discounts retroactively or after the sale is expired, (purchases made before sale periods) with the exception of purchases made within a 24-hour period prior to a sale. Upon request, we will make the sale price adjustment to those orders. Payments Plan, Coupons and volume discounts do not apply during a sale. Gift certificates are still honored during a sale. Q. Who is Vincenzo Taormina? A. An extremely creative and innovative Italian jewelry designer. He created The Taormina Jewelry Brand and he is the CEO and founder of Taormina Jewelry, Inc. based in Philadelphia USA. Q. Is your jewelry handmade? My Handmade jewelry is jewelry which has been assembled and formed by hand rather than through the use of machines. According to the guidelines of the FTC, in order to be stamped or called HANDMADE the work must be made solely by hand power or hand guidance, also means that jewelry may be made using drills, lathes, polishers, or other machinery, but it must be guided by human hand. We DO NOT mass produced our jewelry, and we DO NOT use punch presses and CNC machinery. Findings, Clasps, Joints, Hinges, Chains and every single piece from his Jewelry Catalog are individual Work of Art, totally Handmade and designed and created by Vincenzo Taormina Master Jeweler, in his Atelier Studio located in Philadelphia. Q. Do you guarantee your Jewelry? A. Yes, we do! Please read our WARRANTY section above. A. Images on Etsy website are enlarged in many instances to show detail. To visualize the real size of the item shown in the image, please check the description to see the exact dimensions (inches and centimeters) of the items. Q. Does your jewelry give allergenic reactions? A. We only use Stainless Steel 316 which is Hypoallergenic. We have been in business for 10 wonderful years and so far no one ever complained about allergenic reactions. Q. What kind of Gold do you use in your jewelry? A. All gold accents in our jewelry is 14kt Gold filled. Q. What kind of Pearls do you use in your jewelry? Note: all our Black Pearl are slightly baroque (not perfectly round). Q. Do your jewelry tarnish? A. No. Stainless Steel needs little maintenance, it's waterproof, will never tarnish and is not subjected to oxidation (doesn't rust ). Q. Can I swim and take showers with your Stainless Steel jewelry? A. Yes you can. Note: always after showers and swim in salty water, rinse your Stainless Steel Jewelry with freshwater, soap and wipe them off. Q. I notice that my jewelry after wearing, have some scratches. What should I do? A. Like every other piece of jewelry or watches in Stainless Steel, needs a bit of periodical maintenance routine obviously no so often like Platinum or Gold or Silver. You can go to your local jeweler and have it polished (they do this service usually for free or for few dollars), exactly like you would bring your dress to the dry cleaning, or you can ship to us and we will polish and refinish for you free of charge, but we offer this free service only 1 time, after that there will be a charge of $45.00 for each time you send to us. Q. I have noticed that the rubber in my necklace/bracelet it become Harder/stiff/broke, why? Q. I just placed an Order. When I expect to receive it? Q. What if I need my order sooner? All Express Shipment order are usually guaranteed to be received up to 5 business days from order date. NOTE: For additional Shipping Policies and INTERNATIONAL Shipment Policies please read below in the Shipping Policy Section. Q. I received a Gift from Taormina Jewelry, but it's the wrong size.. now what? A. If you received a gift and you realized that you need a different size or length, please contact us, and we will direct you how to exchange it. 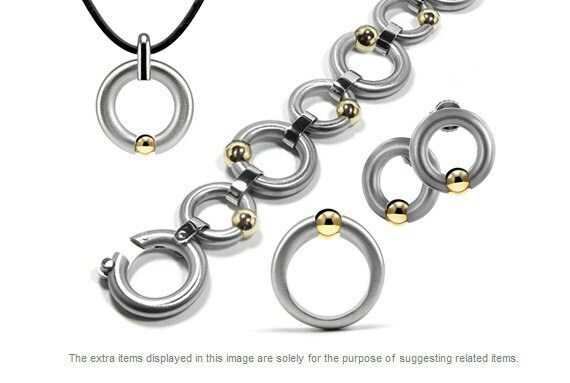 Q. I purchased a TENSION RING from Taormina Designs and I ordered the wrong size,what should I do? Q. Can I order Any ring sizes, necklace's and bracelet's length? A. Yes. All our jewelry are Made To Order, so if you desire to order different sizes/proportions, of any item shown in our catalog, please write measure in the "message to seller" during check out. Q. Can I order quarter and half sizes on Rings? A. Yes. Ring's Sizes for Woman and For Men starts from size 4 to size 13 also ¼ ½ ¾ sizes are available. Please indicate size desired in the "message to seller" during checkout. Q. If I own a Diamond or Gemstones, can you set it into Taormina's Ring mountings? A. No. For technical and warranty reasons we cannot accommodate this request. Q. Can I order different beads colors and Gemstone that are not listed in your Color Chart? A. Most of the time Yes. Please start a conversation thru ETSY Mail system, and we can discuss it. Q. Can I order different width or height of earrings and pendant? A. Yes. All our jewelry are Totally Handmade, so if you desire to order different sizes/proportions, of any item shown in our catalog, don't hesitate to ask. PPlease start a conversation thru ETSY Mail system, and tell us what you have in mind. Q. Are there extra charges for different sizes or lengths? A. No. 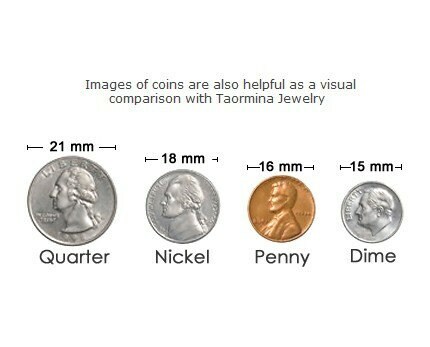 We like to keep our jewelry prices the same regardless the different dimensions. Please start a conversation thru ETSY Mail system, and we can discuss about the length you prefer along with your name and last name you used to purchase the item and we will accommodate your request. Q. What kind of payments do you accept? Q. Do you accept alternative form of Payments? Q. Why are orders shipping to Pennsylvania addresses taxed? A. Taormina Jewelry Inc. is based in Philadelphia, Pennsylvania. According to state and federal tax rules, we are required to charge 7% sales tax on any item shipped to a Pennsylvania address..
Q. I understand that Taormina's Shipment requires signature upon delivery. What if I can't sign? A. Please start a conversation thru ETSY Mail system, and we can discuss it. Q. Do you accept International Orders? A. Yes. For ALL INTERNATIONAL ORDERS we ship UPS Express Saver. The cost of shipment vary depending of your country. The shipment fee is listed at the bottom of every single page. Q. Do you accept returns or exchanges? A. We pride our selves on offering the highest quality merchandise. Q. Should I pay the shipping charges for returning the Item to you? A Yes. The shipping fee for returning the item back to us is the responsibility of the Buyer.